Evanescent— The Sun is breaking through the high fog over the mountains to highlight the hill tops. “Evanescent” is not a word I use often, if ever, but this is the WordPress Weekly Photo Challenge where unusual words are used to try to inspire us bloggers to pull out unusual photos from our catalog. 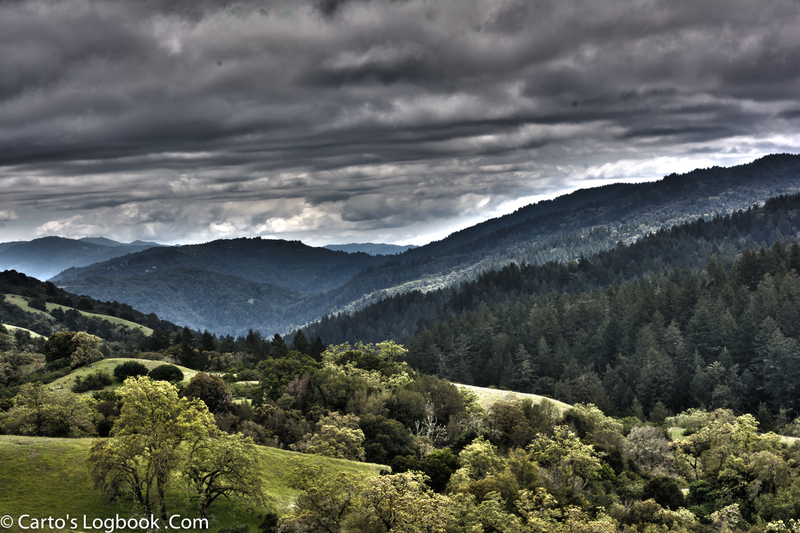 This photo was taken at the Monte Bello Open Space Preserve as the Sun started breaking through the morning clouds. I processed the photo in Develop Module of Lightroom CC, and finished with the Google Nik Collection HDR Efex 4. The high contrast interpretation of the view seems to fit the moment. After taking the shot above, I turned northward and noticed that the fog was disappearing, which created another evanescent moment. Wow, two in one day! This photo was processed in the Lightroom CC Develop module (colors adjusted with the HSL Tab). Please click on the images to bring up a higher resolution view. The Weekly Photo Challenge is sponsored by WordPress. The entries can be perused, here. The composite image was created with Lr Mobil, Lightroom CC and Photoshop CC. The images were loading into Lr Mobil on the iPhone, which uploaded them to the Creative Cloud and synchronized them with the Lr catalog on my MacBook Pro. The images put into a collection, and opened as layers in Photoshop CC: The close up of flowers and seed pods was the background and the image of the bench was Layer 1. The blending mod of Layer 1 was set to Overlay. In Photoshop CC, the flowers and seed pods of the background were selected and a new layer created with the selection as mask. The new layer was moved to the top of the layer stack and the blend mode set to overlay. The composite image was toned, and the layers merged. The merged layer was duplicated, and the Find Edges filter applied. The blending mode on the new layer was set to the Overlay mode. The result of this exercise was the image at the top of this post. Click on any image to get a higher resolution view. Presented above is an iPhone 7plus image taken in full mid-day sun from the Palo Alto Baylands (looking South toward Skyline Amphitheater and Mt. Umunhum). The original photo was imported into Lr Mobile from the Camera Roll and synchronized to Lr on my MacBook Air desktop. The photo was cropped, straightened, and toned in the basic panel and some spots removed and, finally, spring flowers were blended into the lower left corner to make the final composite. The image was exported to the desktop and then uploaded to this blog. Lr Mobil is an efficient way to quickly process photos from the iPhone. In a previous blog I used the Lr Mix and Lr Fix to process on the phone, and, in this test, I processed on the desktop. The two workflows seem equivalent for low-resolution photos for the www. Either workflow will produce good resolution, square-cropped images for my Instagram feed, here. While doing this test, I noticed that my other desktop ( a MacBook Pro) was synchronized to a copy of the same Lr Catalog as my MacBook Air — the iPhone photos upload to both desktops (Is that a side effect, Adobe?). The edits on the MacBook Air did not synchronize to the MacBook desktops. I created a synchronized collection with the edited, virtual copies of the originals, which downloaded to the iPhone. The gallery above shows the original iPhone image, the virtual copy toned and adjusted in Lr and Photoshop CC, and a square cropped version suitable for Instagram. 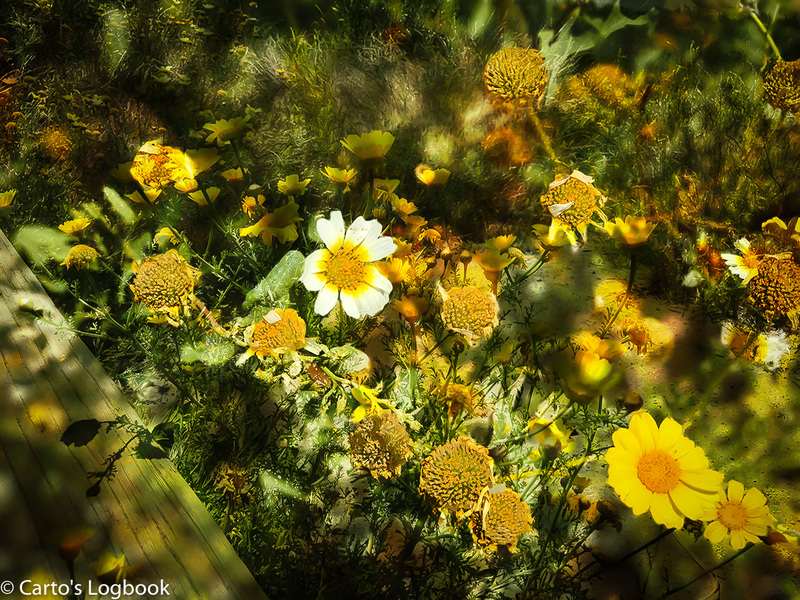 The latter image has Spring flowers blended into the lower left corner using PS CC. Click on the gallery to enlarge the photos. It’s official — The Grateful Dead & Company with John Mayer are on their Summer Tour and play concerts across the United States. June 3 & 4 at Shoreline. 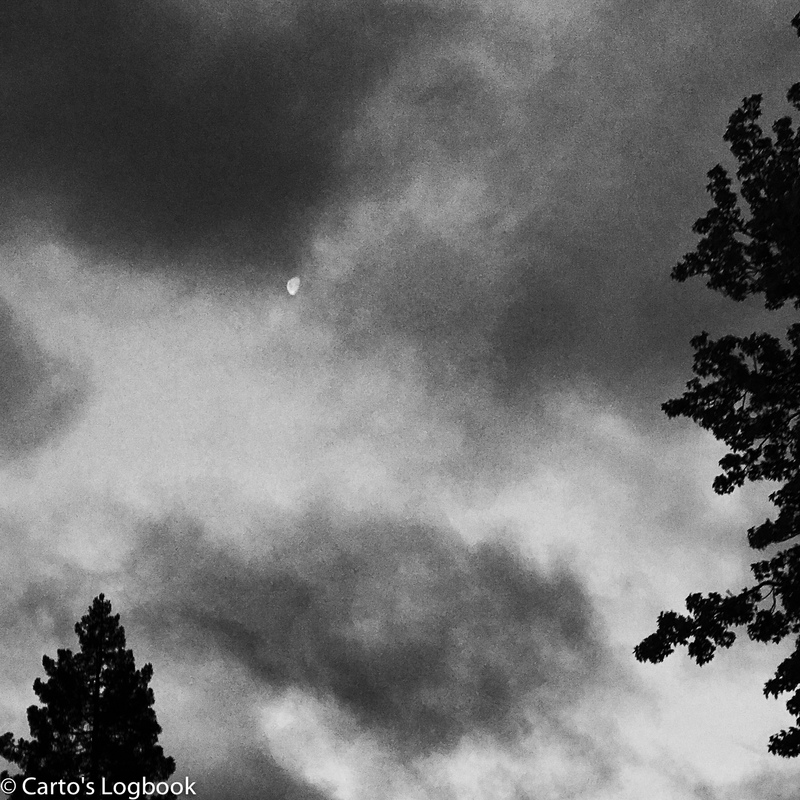 Presented above is a second edit of “Moon in Clouds, Early Morning”. The original photo that was imported into Lr Mobile, was in the synchronized folder on my MacBook Pro. Today, I processed a color version, converting the original color photo to a bi-color version using Color Efex Pro 4. I also used the LR Develop module to quickly remove some power lines, and then exported the file to the Mac desktop after adding my logo and resizing to 1,200px. I re-imported the desktop photo into LR and added it to my Lr Mobil synchronized collection, which downloaded automatically to my iPhone. As an aside, I edited the synchronized LrMobile photo, replacing the original in the Lr Mobil catalog. You might not want that result. After this test, I had a camera roll with the original photo taken by the camera, and, in my Lr Mobil Catalog are two photos: COx-Moon2-IMG_3883.jpb (807kb with logo) and IMG_3883.jpg (edited 1.3mb w/o logo). Somewhat convoluted workflow, but it seems to work. The Adobe engineers deserve a lot of credit for making this possible. I’m getting to like this product. Early morning in Palo Alto with moon visible. Photo taken with my iPhone 7+ and processed in Lr Mobil, LR CC, SilverEfx Pro 4, and PS CC. Just playing around. Open Lr Mobile and select photo from Camera Roll. Upload (Ps Fix at Max Size) – Square crop & Tone. The whole effort on Instagram took less than 15 minutes. 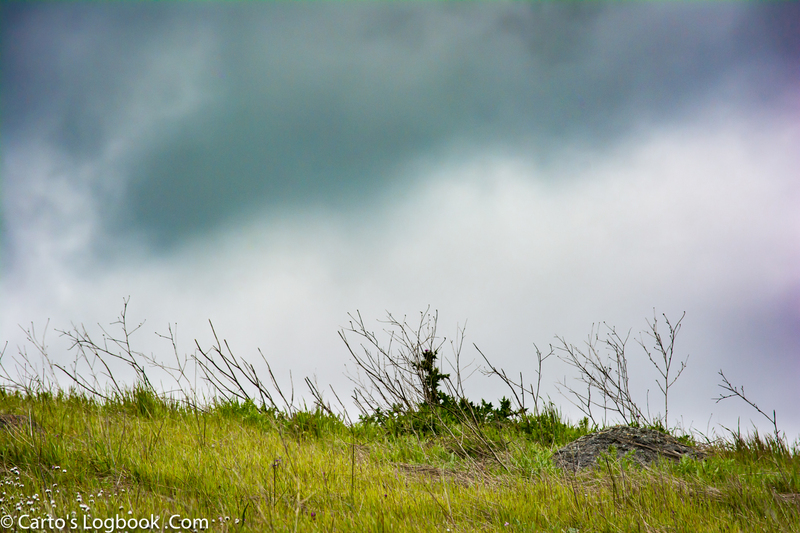 These photos were taken at Windy Hill Open Space Preserve near the trail head in the parking lot off Portola Road. All photos taken with a Sigma DP2 Quattro, and processed with Lightroom, Photoshop and HDR Pro (click image to start slideshow and show camera settings). Windy Hill Preserve is a great place to walk and photograph— this shot was taken in late Fall at the first rise on the trail from the parking lot off Portola Road. On this misty day, the trail is damp and there are occasional puddles. The light is subdued by cloud cover. I used a tripod to steady my Sigma DP2 Quattro, and set a high f-stop to get a wide depth of field. Three shots were taken; bracketing exposure +1 and -1 ev. The photos were uploaded to Lightroom CC and then processed in HDR Pro (Photo/Edit In/Merge to HDR Pro in Photoshop). The untouched result from HDR Pro was returned to Lightroom, Developed in the Basic Panel, and sharpened before exporting as a web sized file for this blog.